Sewing machine needles look very different from hand sewing needles. Best Sewing machine needles have their eyes located very close to their points, or the tip of the needle. The eye is followed by a flat scarf of metal with a groove in it followed by the shaft of the needle which has a rounded side and a flat side. The shaft is shaped thus so that it is easy to ascertain the correct position in which it should be inserted into your sewing machine. 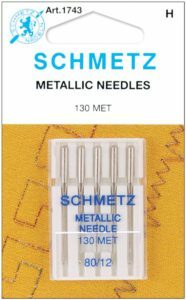 Sewing machine needles are made especially to suit your sewing machine and quickly and easily sew thread through any fabric. Milliners or straw needles have longer shafts and may be used in pleating and basting. The more delicate your fabric, the finer the needle and the finer the thread you should use. If your stitch is uneven or ragged looking, the first thing to try to correct the problem is to insert a new needle. Needles can develop burrs that cause pulls and uneven stitching. 2 What Are Different Types of Sewing Machine Needles? 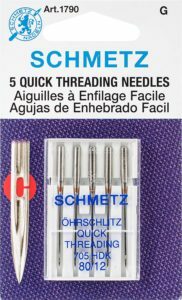 What Are Different Types of Sewing Machine Needles? 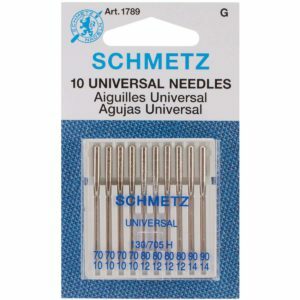 As the name denotes, the universal needle is good for pretty much all basic sewing. In fact, this is the needle that comes with most standard sewing machines. 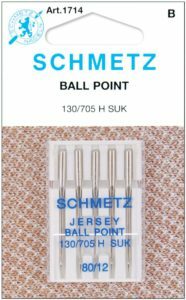 This general needle features a slightly rounded point making it good for woven and knit fabrics. For sewing on any regular cotton projects, the universal needle is your best bet. Pro Tip: It’s always a good idea to have an extra pack of universal needles on hand! There’s nothing worse than having your last needle break right in the middle of a project, and the universal needle can be subbed in for most needles. Best for Woven fabrics, knits, cotton, poly/cotton, silks, linen, nylon, polyester, tulle, velour, organza, wool, and fleece. The ballpoint needle has a rounded point that allows it to slip through the yarns and threads of fabrics without cutting them. The rounded end allows it to slide between fibers rather than through them, so it helps you avoid snagging, runs or creating holes while you’re sewing. Best for: Cotton knits, jersey, polyester, poly/cotton, rib knits, double knits, interlock knits, spandex. If you’ve ever tried sewing on stretch fabric and wanted to send your machine sailing out of a window because your thread keeps breaking, skipping or tangling, don’t blame yourself, blame your needle. A stretch needle is designed specifically with a larger scarf that creates bigger loops in the stitches to avoid broken or skipped stitches. This needle is a must for 2-way stretch fabrics (like the kind that bathing suits are made of) and makes installing elastic much easier too! Best for: Stretch knits, lycra, spandex, elastic, silk jersey, dance and swimwear fabric. 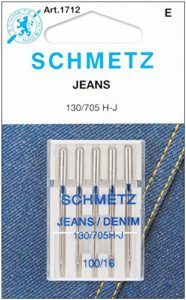 This needle is made for, you guessed it, sewing heavier fabrics like jeans and denim. The shaft of the needle is super sturdy and thicker, and the point is sharp with a slender eye. This allows the needle to pierce through heavy fabrics without breaking. 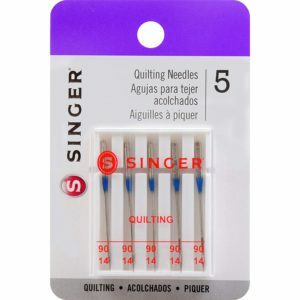 Use one of these needles if you’re hemming/altering jeans or working on thicker fabrics. It’s far better than the frustration (and cost!) of breaking a bunch of thinner needles. Best for Denim, canvas, twill, topstitching heavy fabrics. 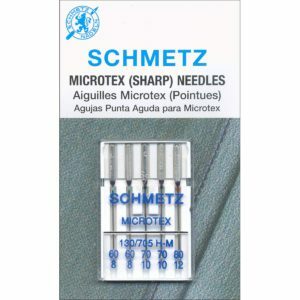 This needle has a super sharp point that allows it to penetrate fine, densely-woven fabrics effortlessly. 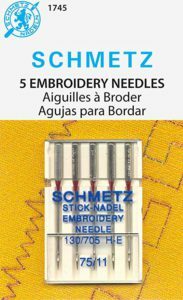 It’s also ideal for detailed topstitching, appliques and creating buttonholes since the sharp point gives you precision and accuracy while stitching. Best for: Vinyl, silk, densely-woven fabrics, synthetic leather/suede, microfiber, taffeta, sequined fabrics, appliques. When you’re making a quilt, you’re sewing through multiple layers of cotton and batting, and you need all your beautiful and hard work to stay in place. 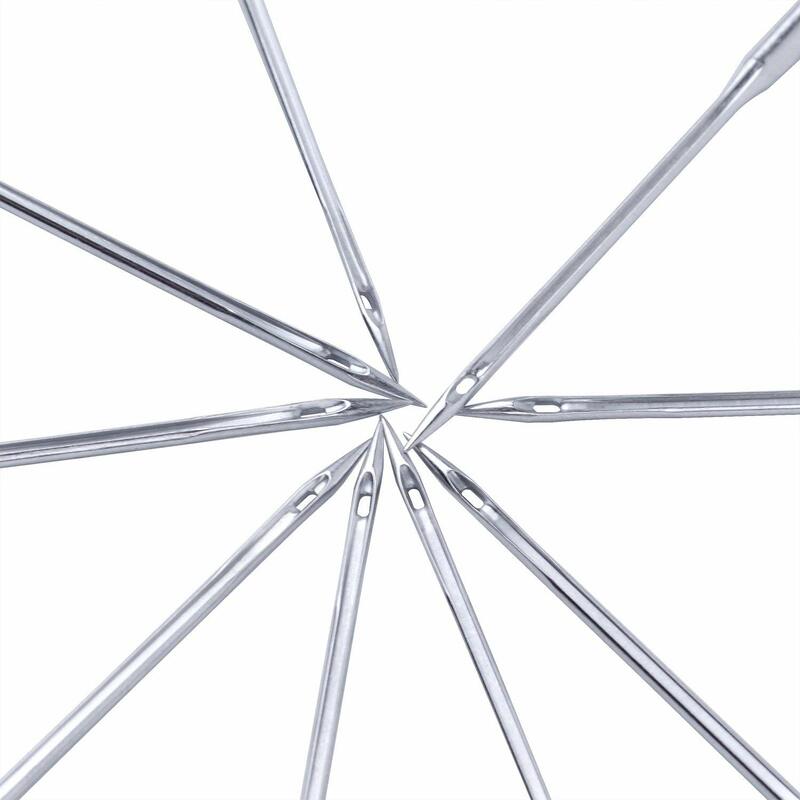 The quilting needle is designed with a long, sharp point that allows it to go through multiple layers at once without disturbing them and keeps your stitches straight and uniform. Best for Quilting, sewing through or topstitching multiple layers of fabric including batting. The embroidery needle includes a larger eye that allows thicker threads, like those used in embroidery, to pass through without tangling or breaking as you sew. The scarf also protects threads from fraying or breaking when sewing at high speeds. It also features a super sharp point to penetrate fabrics – or multiple layers – easily so you can show off your amazing decorative stitching skills with ease! Best for: Decorative stitching with rayon, polyester, cotton, acrylic or specialty embroidery thread. Like the embroidery needle, the topstitching needle has a large eye to allow thicker threads to pass through. The difference is that it has a slightly longer, sharper point so it can easily go through medium to heavyweight fabrics or several layers. Best for: Topstitching, decorative stitching. Creating decorative stitching with metallic thread can be tricky, but it’s easier when you have the right needle! A metallic needle has a large eye, long scarf, and sharp point, all of which work together so you can work with thick, metallic threads without them breaking. Best for Metallic or monofilament threads. If you’ve ever tried sewing through leather with a regular needle, you know it can be almost impossible to do without your thread breaking. Make things easy and get a leather needle. It has a unique chiseled, sharp point that cuts as it sews so it can go right through super heavy fabrics. Best for: Natural leather or suede. DO NOT use synthetic leather, suede or vinyl! A self-threading needle?! What is this wizardry? It is as good as it sounds. It’s a universal needle with a slit in the side of the eye. Instead of breaking out the magnifying glass and thread wax in an attempt to get the end of the thread through the tiny eye, you slide the thread down the needle until it pops into the eye. Honestly, why don’t they make all needles like this? Best for: Wovens, knits, synthetic leather and suede. Used mostly for decorative and heirloom stitching, the wing needle has flared on each side of the shaft which produces bigger holes. The twin needle is a fun little shank that holds two needles side by side so you can create perfect double rows of stitching. 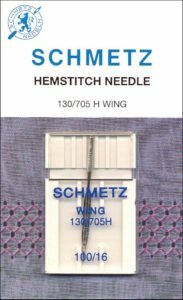 You can use this for hems, topstitching or decorative stitches. Throw an extra spool pin on your bobbin winder to hold a second spool of thread, and get to double stitching! Best for: Creating double rows of stitching. Can be used with universal, denim, stretch, embroidery or metallic needles. You can also use it with one universal and one wing needle. 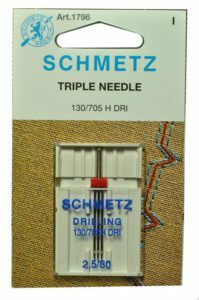 Like the twin needle, the triple needle is a single shank that holds three needles. Use this to create decorative topstitching or embroidery. 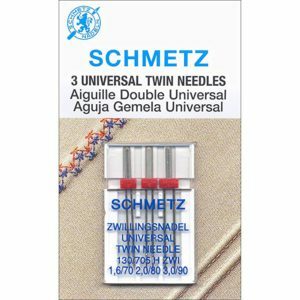 Click the photo to see the Price on AmazonThe triple needle can typically only be used with universal needles, and you should also make sure your sewing machine is triple-needle compatible. Best for: Decorative topstitching or hemming. Sewing needles come in all shapes and sizes. They even differ depending on whether you are hand-sewing or using a sewing machine. These are again available in a variety of sizes and are generally used in the top end embroidery machines. These machines produce intricate designs at a significant speed. The needles enable the machine to sew dense designs without snagging at the fabric or breaking the needle. 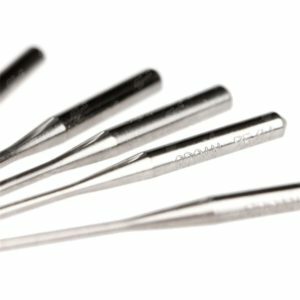 More recently Titanium needles have become available. The titanium needles are able to cope with the intense heat that is created by the rapid movement machine to create these designs and not break as an ‘ordinary’ needle would. 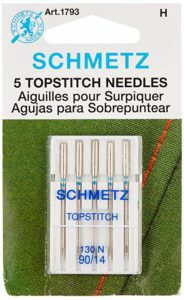 Embroidery needles also have larger eye’s to accommodate the slightly thicker nature of embroidery thread. Hand sewing needles vary according to what fabric you are using. Hand sewing needles vary in the size of the shaft and eye of the needle as well as the length, width, and type of point. A sewing needle has three parts: the tip that pierces the fabric, the eye of the needle through which you put thread and the shaft connecting these two parts. Different fabrics require differently shaped needles; sewing needles are made to pierce fabric without damaging it. Needles come in different sizes. There are two different sizing systems in sewing, the imperial system, and the metric system. From smallest to largest, the imperial sizes range from 9 to 18, and metric needles range from 65 to 110. Most needles are labeled with both denotations. The most common needles used are quilting, sharp and applique needles. 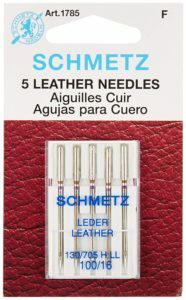 Leather needles have a wedge-shaped tip to pierce through leather or vinyl without tearing it or damaging the fabric. A sailmaker needle is used to construct materials out of heavy canvas fabric. A beading needle has a very thin shaft and narrow eye to go through the holes in the core of beads and make beautiful embellishments with beads to fabrics. Bodkin or ballpoint needles are used with woven or knitted fabrics; they don’t disturb the knitted fibers within the material. Tapestry and chenille needles can be threaded with thicker threads and pierce through tightly woven chunky fabrics. What do the numbers on sewing machine needles mean? Why do my sewing machine needles keep breaking? How to identify sewing machine needles? What do the colors on sewing machine needles mean? The correct needle style to use depends on the type of fabric you are sewing. Needle size is usually indicated on the needle by a small band of color just below the top color of the needle. A small orange band means size 11/90, a small blue band means size 14/90, and a small purple band means size 16/100. 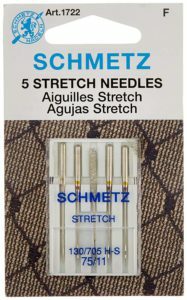 How to sharpen sewing machine needles? A used piece of fine-grit sandpaper is also ideal for this purpose. Place used pieces into your sewing basket for such a need. All you need to do is pierce the needle through the sandpaper a few times to sharpen it. Keep an emery board in the sewing basket for quick sharpening access. Hooray! Say goodbye to the headaches of broken threads, skipped stitches, busted seams and going through tons of snapped needles! Now you know how to find the perfect needle for every sewing project, so you stitch like a master and sew like a pro! Did you discover a new needle that will make your sewing easier? (So did we!) Tell us which ones you’ll try using on future projects in the comments section!